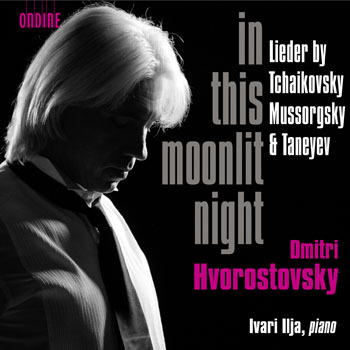 This second release of star baritone Dmitri Hvorostovsky for Ondine features Russian Lieder by Tchaikovsky, Mussorgsky and Taneyev. Dmitri Hvorostovsky is recognized as one of the leading and most charismatic baritones of our time, performing internationally at such opera houses as the New York Met, and partnering regularly with singers Renée Fleming and Jonas Kaufmann. Together with his longstanding duo partner, Estonian pianist Ivari Ilja, they have frequently performed to great critical acclaim. Tchaikovsky composed his song collection Six Songs, Op. 73, in 1893, the year of his death, and they are full of musical nostalgia. Being in a frenzy of creativity after his opera Boris Godunov had been completed and premièred, Mussorgsky wrote his Songs and Dances of Death 1875-1877. Full of emotional excitement are Taneyev's songs, especially Anxiously beats the heart from the Ten Romances, Op. 17.